A Greek Culinary Experience: Land food and wine Adventure! Travel to Mythical Greece! One of the great food and wine regions of the world and Enjoy the Extraordinary Cuisine and award winning wines! Discover the wonderful vineyards of Northern Greece the wider Thessaloniki area, Central Greece and Mainland. Feel and taste few of the most famous wine labels in traditional family wineries. AN IDEAL TOUR THAT WILL SATISFY EVERY WINE LOVER! Spend fourteen wonderful days in Thessaloniki, Northern Greece, Thessaly and Mainland! Combine wine with culture and nature! And this Wine tour is not only about wine! Visit important archaeological sites like the museum of Vergina and learn about local customs. Fill in your batteries in the beauty of learn about Greek wine and food! And this tour will prove that Greek wine is very interesting! · The Cave of Petralona: It is where traces of the first ‘homo sapiens in Europe’ were found. · Winery tours and wine tasting in Thessaloniki: “Wine route of Thessaloniki” Thessaloniki and its surroundings have a variety of vineyards from the coastal lowlands south of Thessaloniki in Chalkidiki to the mountains in the northeast. · Winery tours and wine tasting in Drama: Wine route of Dionysus In the Thracian province of eastern Greece, this tour takes you around Kavala, Philippi, and Drama. You can see Mt. Pangeo, which claims the legend of being the birthplace of Dionysus – the Greek god of wine and pleasure. · Winery tour and wine tasting “Wine route of Pella” The ancient capital of the Macedonian empire, this has been a wine producing region since antiquity. Archaeological finds have depicted Dionysus the Greek god of wine. A holiday packed with so many legendary sites. Savour culture, history and culinary delights anywhere and everywhere along the way. Enjoy the numerous Byzantine monuments of Thessaloniki, walk along the alleys in the centre of city, enjoy Greek wines and visit great wineries! Visit Naoussa, and get to know the VQPRD "Naoussa" that is made of Xinomavro, an indigenous variety! A great combination of city breaks and tours, full of cultural elements and great wines! We will travel through some of the most renowned Greek vineyards. Stop at celebrated wineries to sample favourite wines right where they are produced. Meet the people who make them. Seek out the traditional products of each region’s unique cuisine. You will be happily surprised to find tastes and aromas beautifully attuned to the locale. Enjoy the natural beauty along the Wine Roads of Northern Greece and explore the history that infuses the entire region, from archaeological sites, churches, monasteries, museums, and more to the wineries themselves, restaurants, taverns, hotels and inns, and local gourmet workshops and stores stocked with regional culinary specialties. Visit Petralona where traces of the first homo sapiens in Europe were found. Vergina, the burial site of the Kings of Macedonia, explore Meteora, a natural phenomenal unique in our planet, a guided boat trip takes visitors along the coast line of Mount Athos the unique monastery republic internationally recognised as a sanctuary of the Christian faith where they can view the unique landscape and the magnificent architecture of the monasteries, then there’s Thessaloniki, a city with spectacular food, nightlife & history. Live northern Greece likes a local, and all these while getting the chance to sample wine from some of the best Greek vineyards. Northern Greece is one of the most important wine producing regions of the country. Wine brands produced in this region of Greece have been awarded many international medals and distinctions. Thessaloniki itself is home to many famous wineries. The visits to the wineries often feature lunch at the winery or at a nearby traditional Greek tavern, so we can experience the authentic Northern Greek gastronomy and wine culture. Very close to Thessaloniki, on the hills of Epanomi, at an ideal ecosystem for wine cultivation we will visit Domaine Gerovassiliou voted in the top 100 wineries for 2006. The varieties of Assyrtiko, Malagouzia, Sauvignon Blanc, Chardonnay, Viongier and Syrah, Merlot, Grenach Rouge, Limnio Mavroudi, Mavrotragano give the Regional Wines of Epanomi. Less than 45 minutes North of Thessaloniki, on the slopes of Mt Vertiskos lie the vineyards of Babatzimopoulos Estate. Mr Anestis Babatzimopoulos is a visionary winemaker, so be prepared to be surprised from his wines that combine some of the most known international with local varieties. Except from the great wines you will taste, there is a very interesting oenology museum, with a collection of rare corkscrews dating back to 18th century, 28 rare handmade wine-presses (18th -20th century), amphorae of Mycenaean and Byzantine time and many other old items and tools of the viticulturist. After breakfast we drive to Kavala, following the Egnatia highway, built on the path of the Roman ‘Via Egnatia’. Arriving Philippi we visit the archaeological site of Philippi, i.e. the ‘Forum Romanum’, ruins of the two early Christian Basilicas (the prison where St. Paul was held and preached in 50 AD), as well as the ancient Greek theatre. Ending the tour at Philippi we visit the Texni Oinou domain at Mikrohori Dramas as well as the Vivlia Chora and the Manolesaki, 3 of the greatest wineries of Northern Greece Texni Oinou domain at Mikrohori Dramas: The district, enjoying propitious soil and climatic conditions, has a long history of wine-making, history which is now being revived thanks to the personal initiative and passion of the two winemakers, Yiannis Papadopoulos and Yiannis Kalaitzidis. From these vineyards the estate produces each year no fewer than 60.000 bottles of its label Techni Alipias - the Greek word Techni meaning art or skill and the word Alipia from ancient Greek meaning absence of sorrow. The name was inspired by ancient texts which tells us that "... Dionysos, the son of Zeus and Semele, bestowed on making the gift of wine so that men might forget their sorrows". Breakfast and the tour starts in the village of Arnaia, the best example of well-preserved traditional architecture in the area. Arriving the village quick demonstration by a honey producer and beekeeper and try five varieties of honey and the famous honey-tsipouro “Mountovina”, only found here. 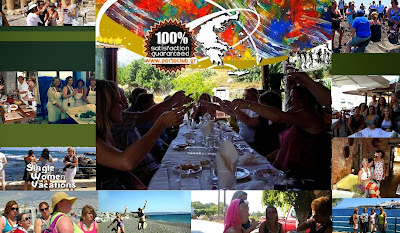 Proceed to the local winery Papayannis and have a tour and wine tasting. Have lunch as it was made in ancient Greece, prepared for you by a specialized chef. Reach the “Aristotle Park”, dedicated to the great philosopher Aristotle near the ruins of his birthplace, the ancient city of Stagira. Ending the tour we drive to the village of Polygyros where we accommodate. Dinner at the hotel with local specialties. From Polygyros we drive to the village Ouranoupolis for a boat trip along the coast line of Mount Athos the unique autonomous monastic community internationally recognised as a sanctuary of the Orthodox Christian faith where they can view the unique landscape and the magnificent architecture of the monasteries. Departure time is 10:30 and the cruise lasts ca. 3 hours. The ship heads to the south western part of the peninsula and in ca. 10 minutes; it reaches the sea-borders of the monastic state and its territory. From there, it arrives in ca. 15 minutes in the area of the first Russian cloister and after sailing by unique beaches, it arrives in the area of the first monastery, Iera Moni Dochiariou, in ca. 40 minutes. Another 7 monasteries follow then, as well as the Holy Mount’s central port, Daphni, and finally the cloisters, small villages, where groups of monks live in every house. Ending the boat trip break for lunch and next visit the Papayannis winery at Arnaia. Bback to the hotel late afternoon. Dinner and accommodation at Polygyros. Today we will head to the area of Chalkidiki. Sithonia hosts the largest winery in Greece and it is also considered one of Europe’s largest at 400 ha. Across the gulf to the east on the Athos peninsula, within the monastic republic is a Tsantali vineyard, which has the goal of bringing the traditional Mount Athos wines to the outside world. The two of the wineries we will visit today: Domaine Porto Carras and Tsantali Agios Pavlos Winery. Llunch in one of the two wineries and early afternoon back to the hotel. Dinner and accommodation at Polygyros. Thessaloniki is Greece’s second largest city and the capital of Macedonia (also voted “Best Mid-Sized European city for human capital and lifestyle” by Financial Times in 2014). It offers a rich cultural and historical heritage as well as a cosmopolitan café life. We will visit some of the splendid churches as well including the Byzantine church of St. Dimitrios. Naturally, there’s also time to enjoy the shopping and cafés downtown. What do you get when you combine Greek coffee, pastries and breads, sweets, Meze, and ouzo? The best introductions into Greek cuisine and culture, all on this tasty Thessaloniki tour. Today we will head to one of the most historic places in Greece and the old capital of the ancient Macedonia state. The ancient capital of the Macedonian empire, this has been a wine producing region since antiquity. Archaeological finds have depicted Dionysus the Greek god of wine. Some of the most important remains are the palace, lavishly decorated with mosaics and painted stuccoes, and the burial ground with more than 300 tumuli, some of which date from the 11th century B.C. The tomb of the Macedonian King Philip, father of Alexander the Great is recognised as a Monument of World Heritage by UNESCO. Philip's tomb complete with its unique valuables are kept in a specially designed museum. The first and the second capital of Macedonia Vergina and Pella give to the visitors the whole history of Macedonia with the spectacular findings of the royal graves in the outstanding museum of Vergina and the brand new museum of Pella. The archaeological sites are 2 of the most interesting in Greece. From here we will continue to Naoussa, the area of Xinomavro. The area of Naoussa is known for the VQPRD Naoussa' made exclusively of Xinomavro. Wine taste in one of the eleven wineries in the area! From Xinomavro and the other red varieties cultivated in the region (mainly Merlot and Syrah) are produced the Regional Wines of Imathia, a white 'Blanc de noirs' and a fleshy and opulent red that endures through time. Morning departure for the Macedonian hinterland. This mountainous region of Greece has become a large wine-producing region. One of the highlights is Kastoria, an ancient centre known for its fur productions, beautifully situated on Lake Orestiada. The town of Kastoria, renown centre of the fur industry and also famous for its lake and 75 Byzantine churches. A Neolithic lake settlement, 7000 years old, was discovered here, and you will have the opportunity to stroll through and admire the reconstruction of the village which represents the contemporary musicological concept. Wine taste in one of the few of the wineries: Amyndio Winery, Kir Yianni Amyndio Winery, Voyatzis Estate, Zandes Winery. Keep driving south direction Meteora and Kalambaka where we accommodate. Dinner at Kalambaka. Visit Meteora among striking scenery, perched on the top of huge rocks which seem to be suspended in mid-air, stand ageless Monasteries, where you can see exquisite specimens of Byzantine art. Depart from Kalambaka direction Delphi. Arrival Delphi early afternoon. The Greek kitchen cooking class at Delphi. Accommodation Delphi. Visit the Archaeological Site and Museum and drive the mountain of Parnassus to the village of Polydroso where we visit the winery Argyriou – one of the best small wineries in Greece -. Wine tasting and lunch on spot. Departure direction Athens. Arrival Athens early afternoon. Dinner at a beautiful restaurant of Athens. Accommodation Athens. Breakfast and transportation to the airport for the flight back home. Αναρτήθηκε από George Portokalakis στις 1:36 π.μ.